Smooth side seam on a shaped, double knit jacquard sweater -- this relatively stable sweater knit was washed before cutting. Back in October of 2016 I had the pleasure and honor of chatting with Chuleenan of CSews about sweater knit fabrics and related topics. While conducting a giveaway, we asked readers what they imagined to be most challenging when sewing sweater knits. The most mentioned challenging issue turned out to be rippled seams; that is, the challenge some face in getting a sewn sweater knit seam to lie flat and not pucker. I'm happy to say that there are solutions to this problem. Some sweater knits are more difficult to work with than others, but there's usually some method or tweak that will give you the smooth seam you desire. Though I've discussed aspects of this issue before, my goal is to tackle the subject in more depth today. Smooth seams begin with well prepped fabric. Just as you would wash any other fabric before you even think of cutting, the same is true for a sweater knit. Sweater knits are generally washed at the knitting mill that produces them, but wax (to help the fabric knit smoothly on the industrial knitting machine) and soil (sometimes present with natural fabrics that haven't been bleached or dyed) may remain in the fiber. Your careful washing of the fabric will do wonders to remove any debris that remains stuck in the yarn. The washed fabric is fuller with a little more body and stability. Washing may impart enough stability to keep the seams from stretching when you sew. Indeed it's the stretch of some sweater knits that causes them to ripple when sewn. Both natural and synthetic fabrics will yield a better result after washing. The key is to squeeze water from the fabric without stretching. (Roll fabric in towel and squeeze. Never wring.) Allow the fabric to dry flat, without stretching, and allow the fabric to find its natural size. Remember to serge or zigzag any cut or unfinished edge before washing and to follow the care instructions for the fabric. Very unstable fabric used for hat with no rippling at the seams -- I used light pressure and a walking foot. So you've washed and allowed your fabric to dry. You're testing your stitches on scraps of fabrics to get your settings on your sewing machine just right, but you're still not getting smooth seams? Your fabric is becoming stretched out as you sew. It could be your presser foot that's causing your troubles. Or more precisely, it's most likely the pressure of your presser foot on the fabric. Imagine as you sew, the feed dogs on the machine below your fabric diligently moving your fabric forward. The downward pressure of the presser foot keeps your fabric flat on either side of the needle. If the presser foot delivers too much pressure, however, it will work against the feed dogs. The standard presser foot sometimes holds the fabric in place allowing the already stretchy fabric to stretch even more as the feed dogs below the fabric work to move the fabric forward. The result is a lumpy, ripply seam. One solution is to reduce the pressure of the presser foot. On some sewing machines reducing this pressure is a simple turn of a knob. (See your sewing machine manual for location of this knob, if available.) On other machines the option is not available. What is available for most machines is a walking foot, also known as an even feed foot. This foot will work with the feed dogs of your sewing machine. The walking foot provides an extra set of feed dogs above the fabric. 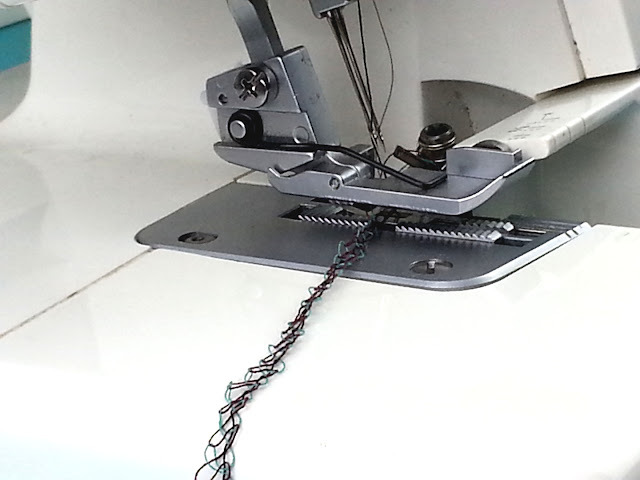 When the walking foot is not integrated into a sewing machine as with certain industrial machines and domestic Pfaff machines, a bar on the walking foot attachment connects with the needle clamp screw of the sewing machine. As the needle moves down, the fabric grippers (feed dogs) on the foot move away from the fabric. The grippers lower to meet the fabric again as the needle raises. Feed dogs above and below work in tandem to advance the fabric forward and the sweater knit is fed evenly through the machine. This synchronized action will prevent stretching in many situations. Whether you're using a serger to finish your seams or for construction, the differential feed ratio must be set up properly. This setting is a ratio comparing the speed of the front feed that brings the fabric to the needles with the speed of the rear feed that moves the fabric away from the needles. A setting of 1 means the feeds are going at the same speed. That setting, however, would stretch out most sweater knits. A setting between 1.5 and 2 will work for most sweater knits. With this setting the front feed is moving 1.5 to 2 times faster than the rear feed, preventing the sweater knit from getting stretched out. In this pic the front feed is to the right of the thread tail and the rear feed is to the left. As with your sewing machine, you’ll also need to set a proper tension and stitch size. Many knits will be more unstable with little recovery closer to the cut edge. They may even have gotten stretched out from less than careful handling. Working with a wider seam allowance and sewing further away from the cut edge is sometimes all that's needed to produce a smooth seam. Steaming a slightly puckered, overstretched seam is definitely allowed and recommended. Hold the iron at least a half inch above the seam, 2 inches or more if working with synthetics. (Try this on a scrap first!!!) Allow the steam from your iron to penetrate the fabric. Then, pat the fabric gently into place with your hand. Let the fabric dry undisturbed to shrink back to size. It's amazing what steam will do, especially with cotton, linen, wool, or silk. But this will only work if the pucker is tiny, so don't depend on this tip if your ripples are major. 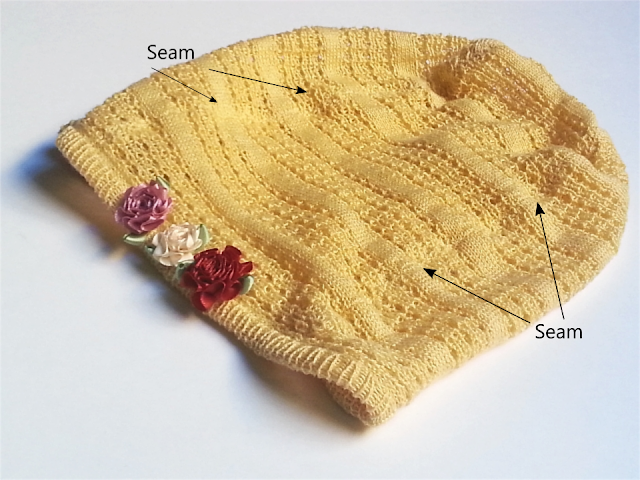 I've compiled these tips into "A Roadmap for Improved Sweater Knit Seams". Newsletter subscribers have already received the link to this download. Others can download a copy by clicking here. Sometimes it's just a matter of practice, learning how to handle various sweater knits, and becoming used to how your machine sews these fabrics. I would love to hear any suggestions and experiences you've had in the comments below. O, how I wish I would have had this information last fall before I ruined some gorgeous (and expensive) sweater knit material. First mistake-failing to surge the raw edges before the pre-wash, I opened the machine to find a giant ball of yarn! Second mistake-since I had lost so much of my fabric, I thought I could make-do by narrowing my seam allowances around the entire pattern. Bad move! The unstable edge of the fabric was a nightmare to work with and I ended up having to resew repeatedly. Trying to use a seam ripper was nearly impossible! The sweater is now finished, it's just small enough to fit a toddler. Armed with what you know now, I hope your next experience with sweater knits is a smooth and enjoyable one! Thank you so much, Tina, and welcome to the site! So glad you're finding it helpful. Please be sure to join the email list for even more tips, if you haven't joined already. And always feel free to ask sweater sewing questions in the comments.